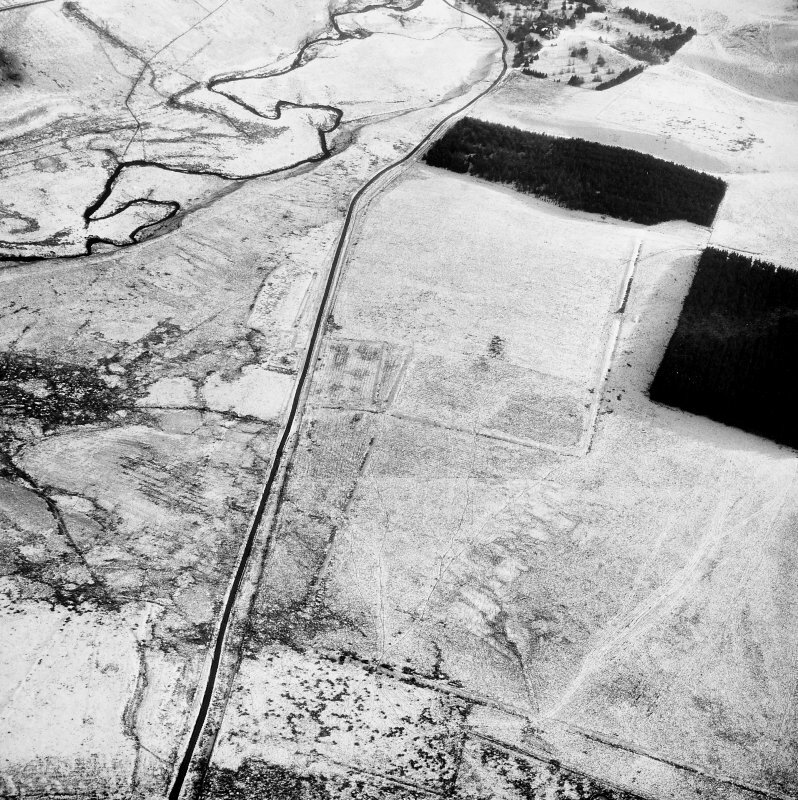 Pennymuir, oblique aerial view, taken from the WNW, centred on three Roman Temporary Camps, a linear earthwork and an area of rig. 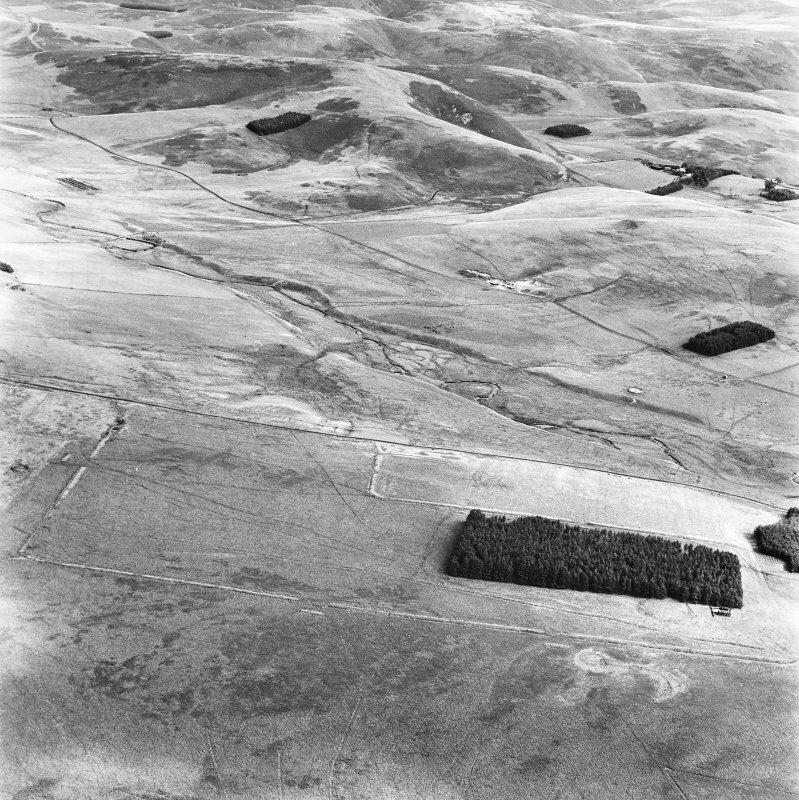 The course of 'Dere Street' is visible in the bottom half of the photograph. 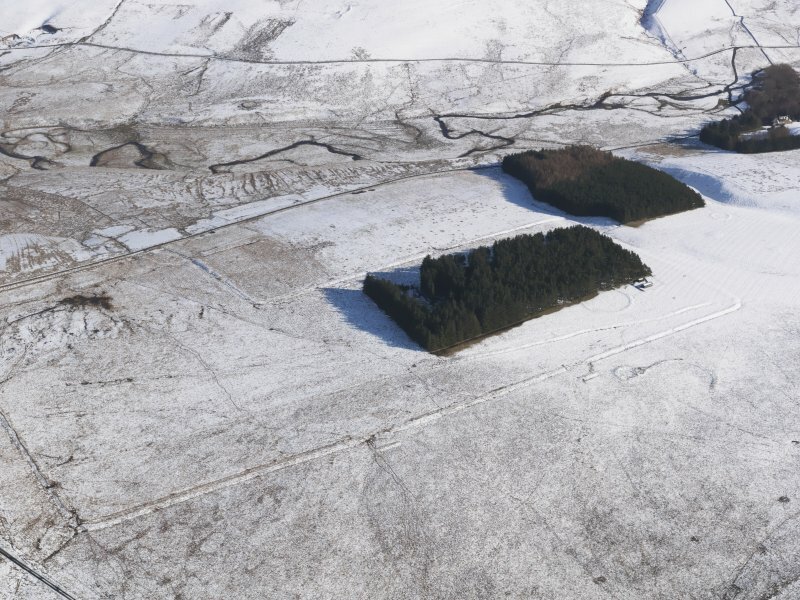 Pennymuir, oblique aerial view, taken from the ENE, centred on three Roman Temporary Camps, a linear earthwork and an area of rig. 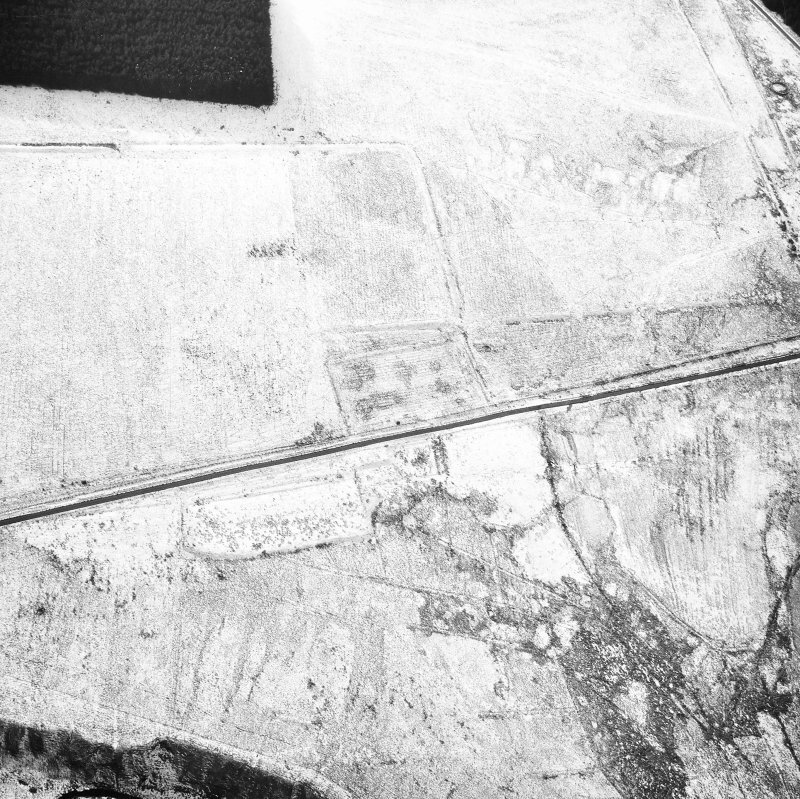 The course of 'Dere Street' is visible in the bottom half of the photograph. 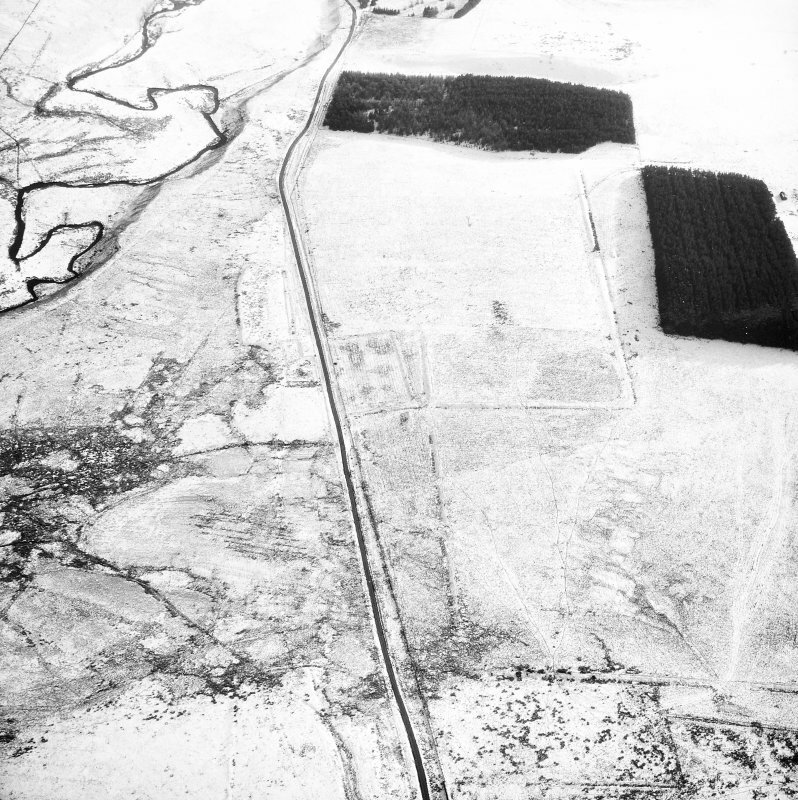 General aerial view of Roman temporary camps and linear earthwork under snow, looking to SSE. 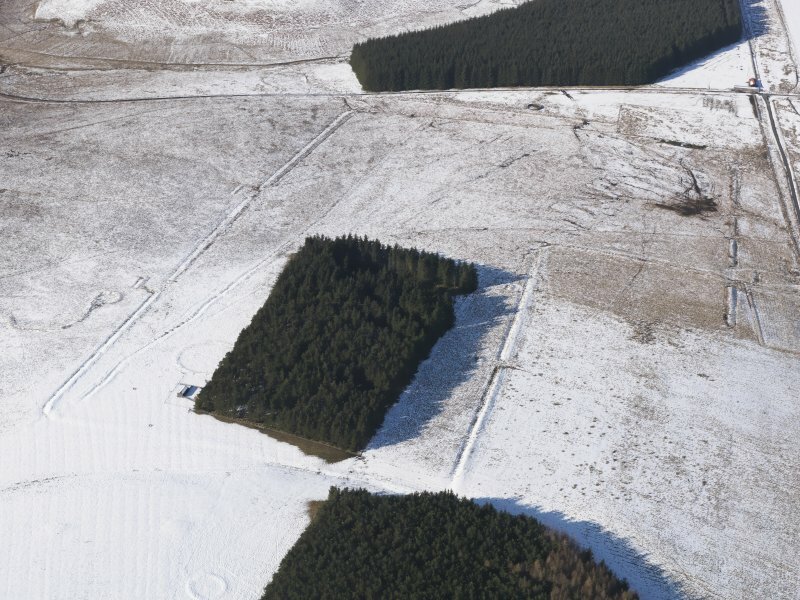 Oblique aerial view centred on the remains of the Roman Temporary Camps and the linear earthwork at Pennymuir, looking WNW. 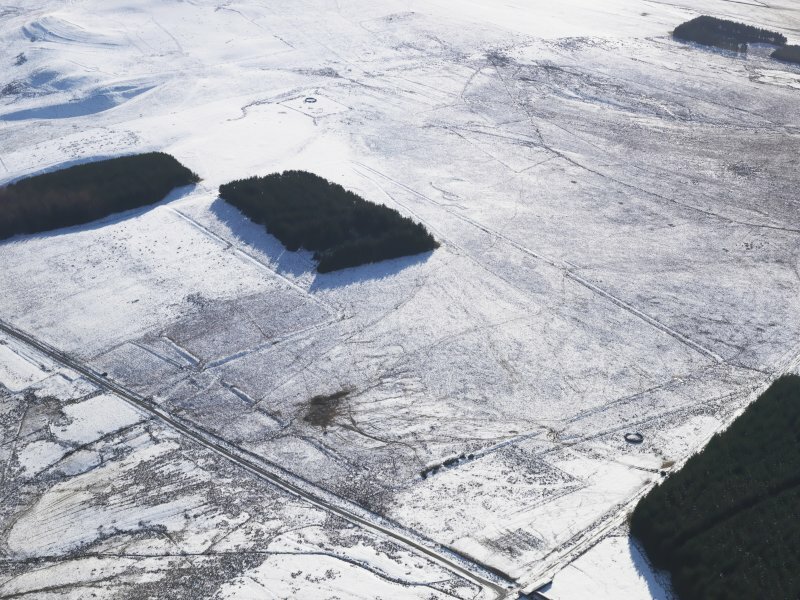 Pennymuir, oblique aerial view, taken from the NE, centred on three Roman Temporary Camps, a linear earthwork and an area of rig. 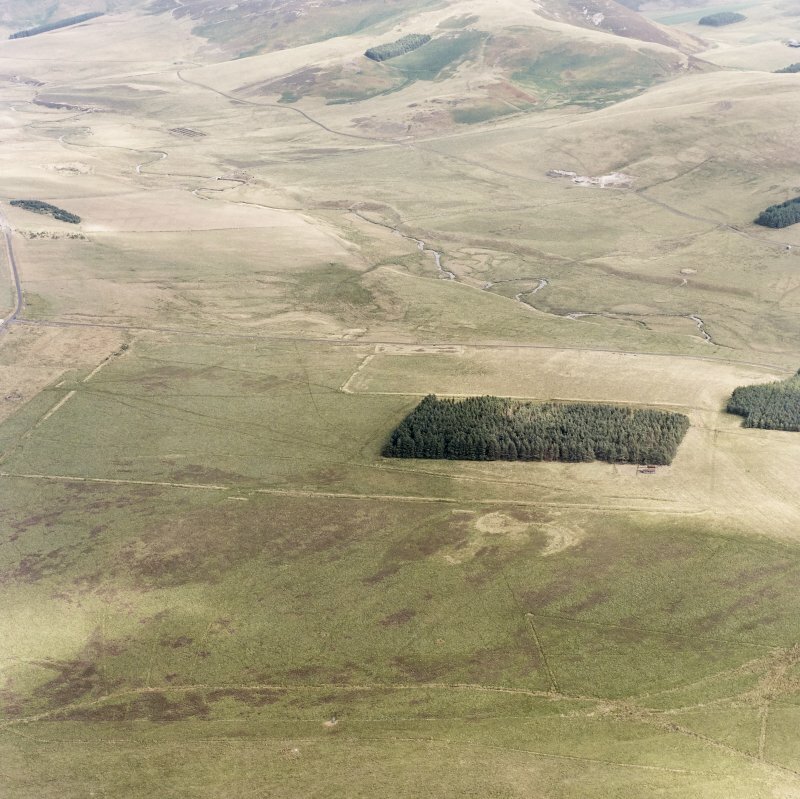 The course of 'Dere Street' is visible in the bottom half of the photograph. 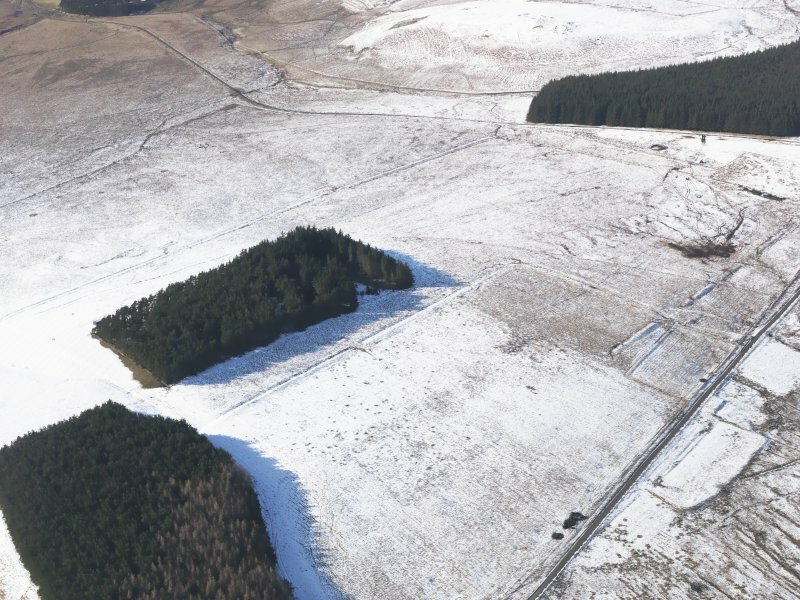 Pennymuir, oblique aerial view, taken from the WNW, centred on three Roman Temporary Camps, a linear earthwork and an area of rig. 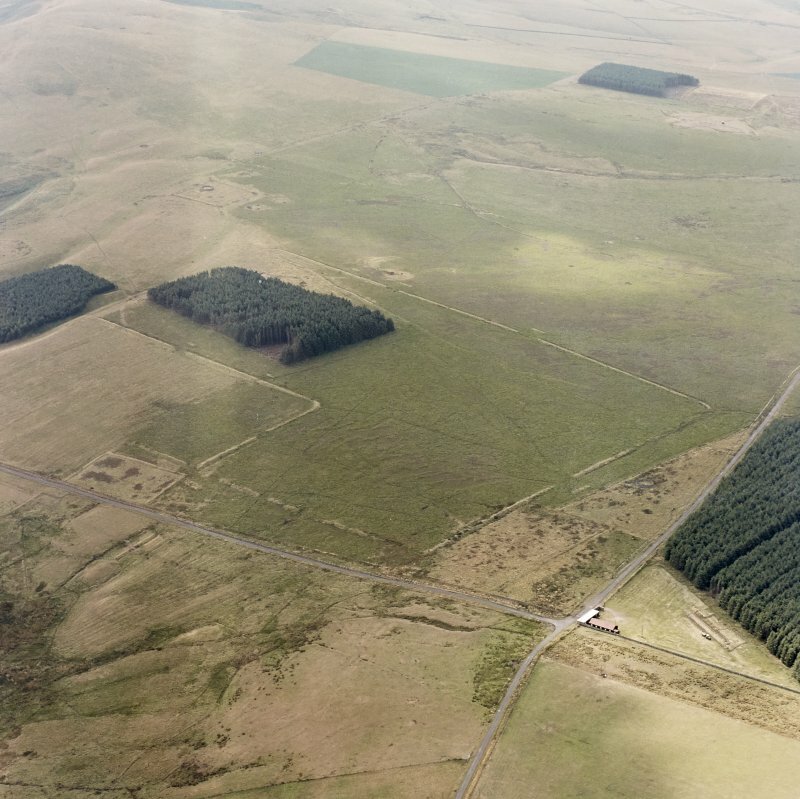 The course of 'Dere Street' is visible in the centre of the photograph. 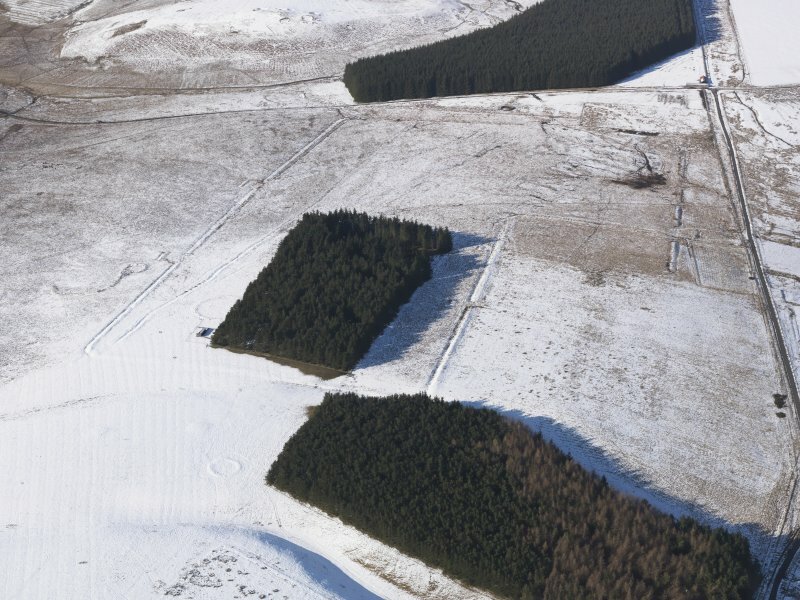 Oblique aerial view centred on the remains of the Roman Temporary Camps and the linear earthwork at Pennymuir, looking NNW. 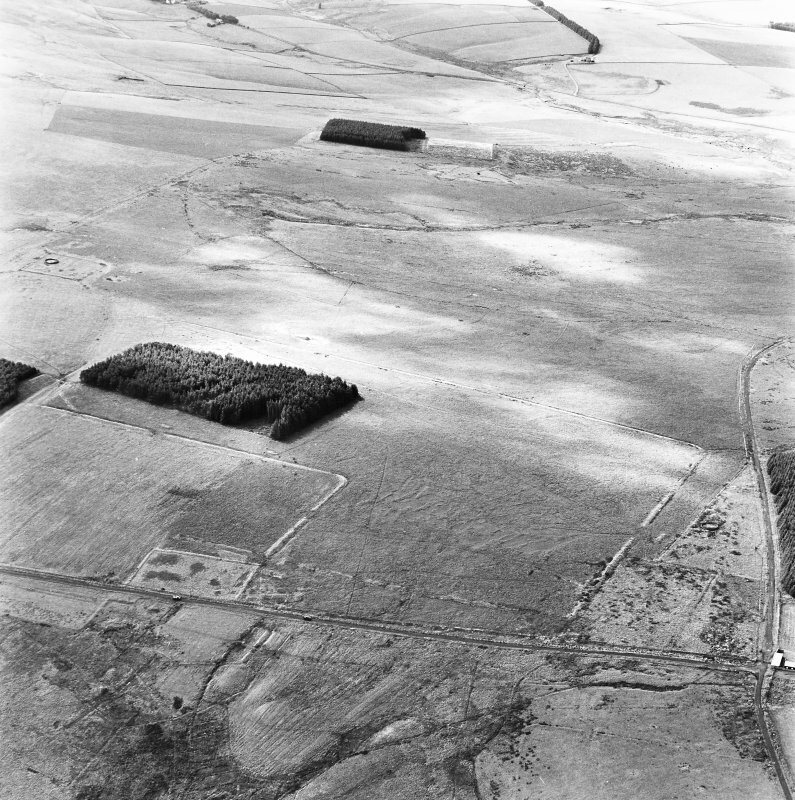 Oblique aerial view centred on the remains of the Roman Temporary Camps and the linear earthwork at Pennymuir, looking SSW. 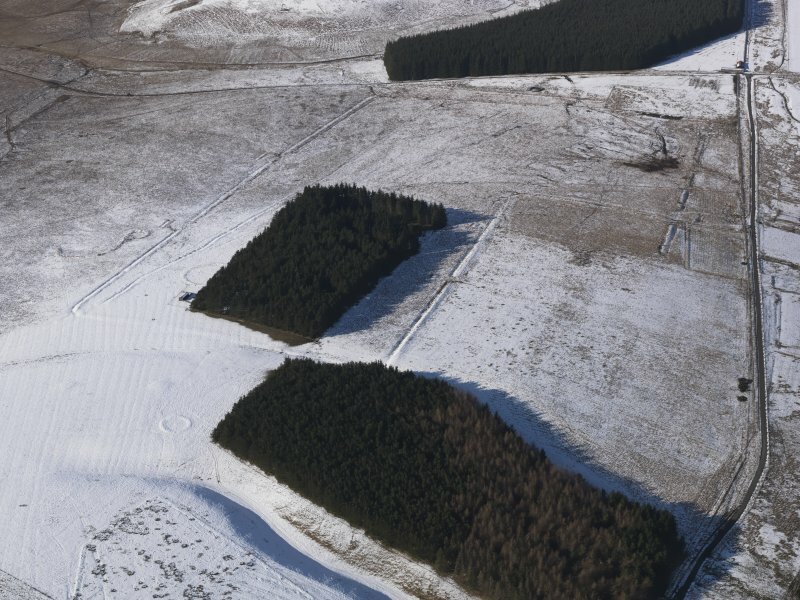 Pennymuir, oblique aerial view, taken from the SSW, centred on two Roman Temporary Camps and a linear earthwork. 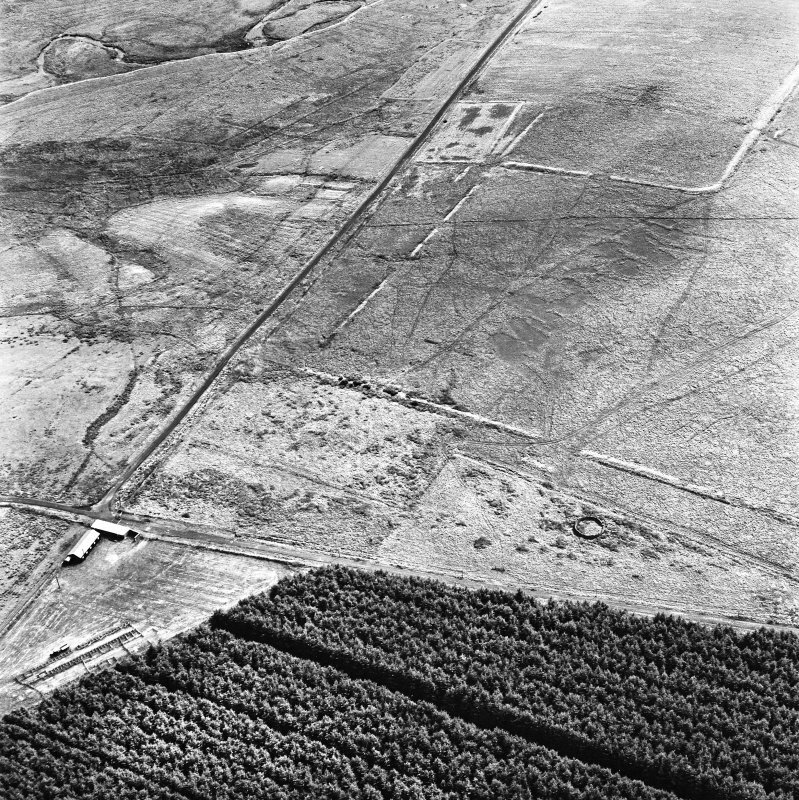 An area of rig and the course of 'Dere Street' are visible in the top right-hand corner of the photograph. 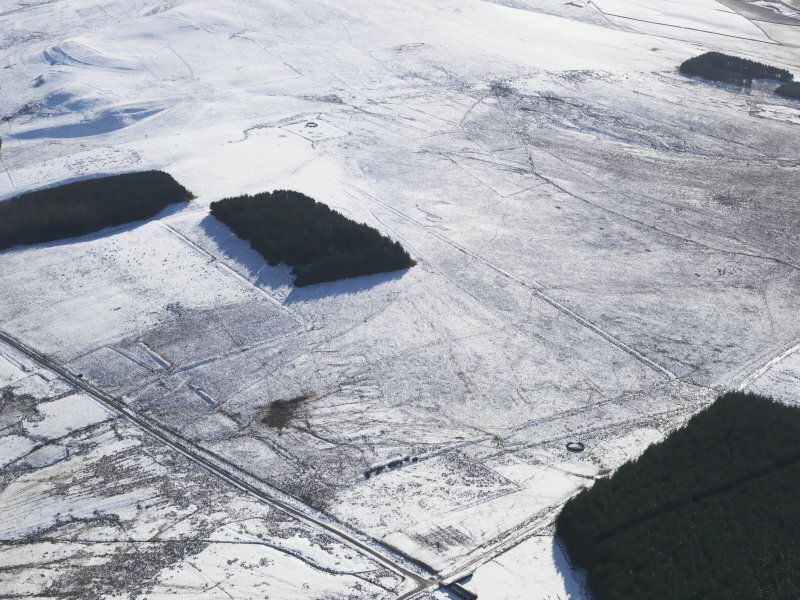 Pennymuir, oblique aerial view, taken from the NW, centred on three Roman Temporary Camps and an area of rig. 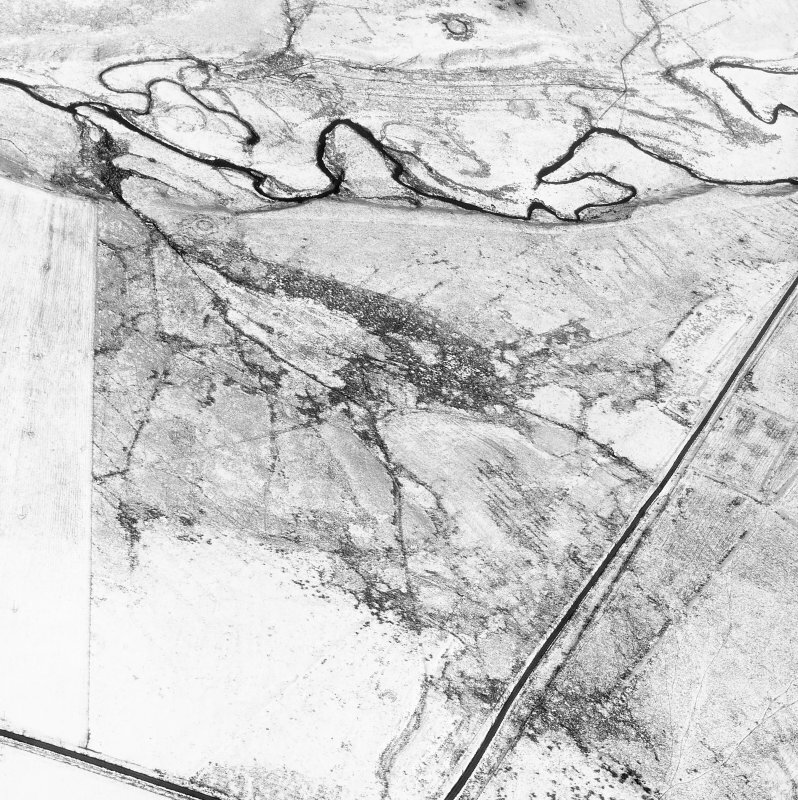 The course of 'Dere Street' is shown in the left half of the photograph. 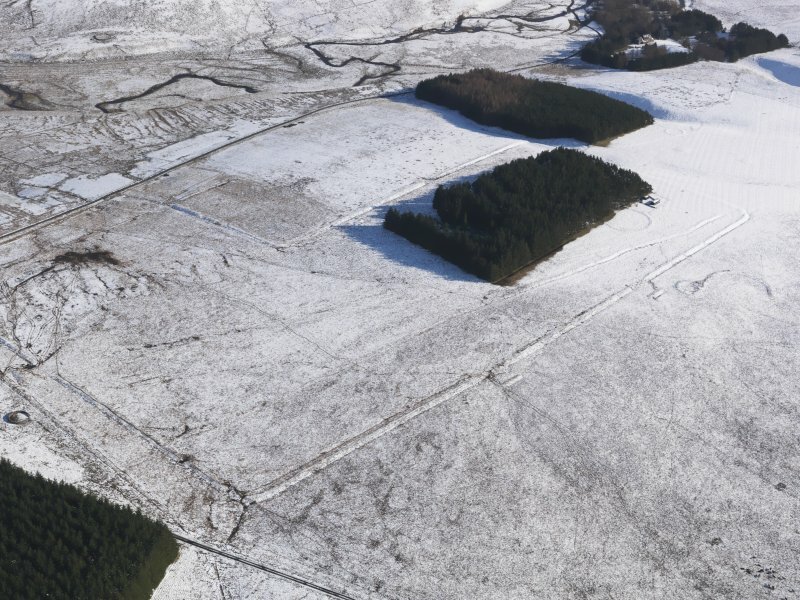 Pennymuir, oblique aerial view, taken from the NE, centred on two Roman Temporary Camps and a linear earthwork. 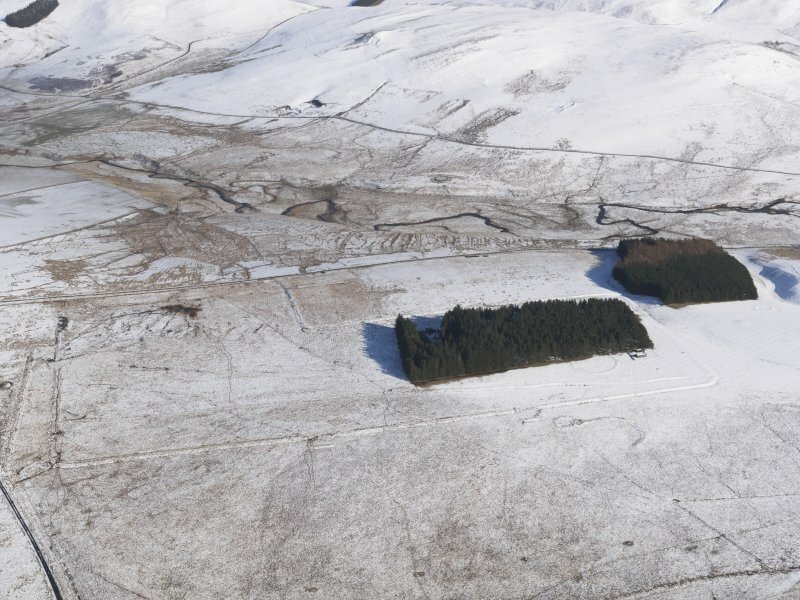 An area of rig and the course of 'Dere Street' are visible in the bottom left-hand corner of the photograph. 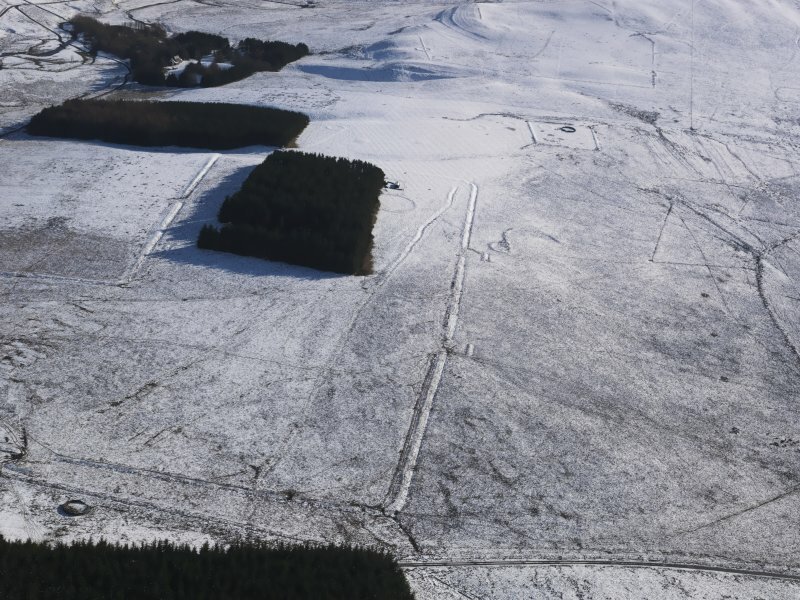 Oblique aerial view centred on the remains of the Roman Temporary Camps and the linear earthwork at Pennymuir, looking ESE. 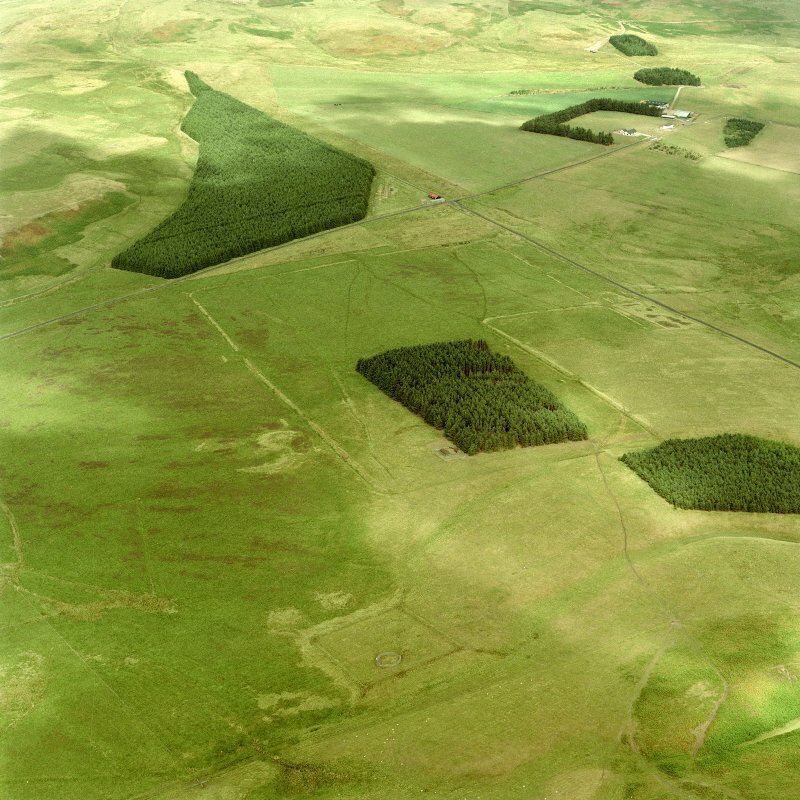 Pennymuir, oblique aerial view, taken from the NW, centred on two Roman Temporary Camps and a linear earthwork. 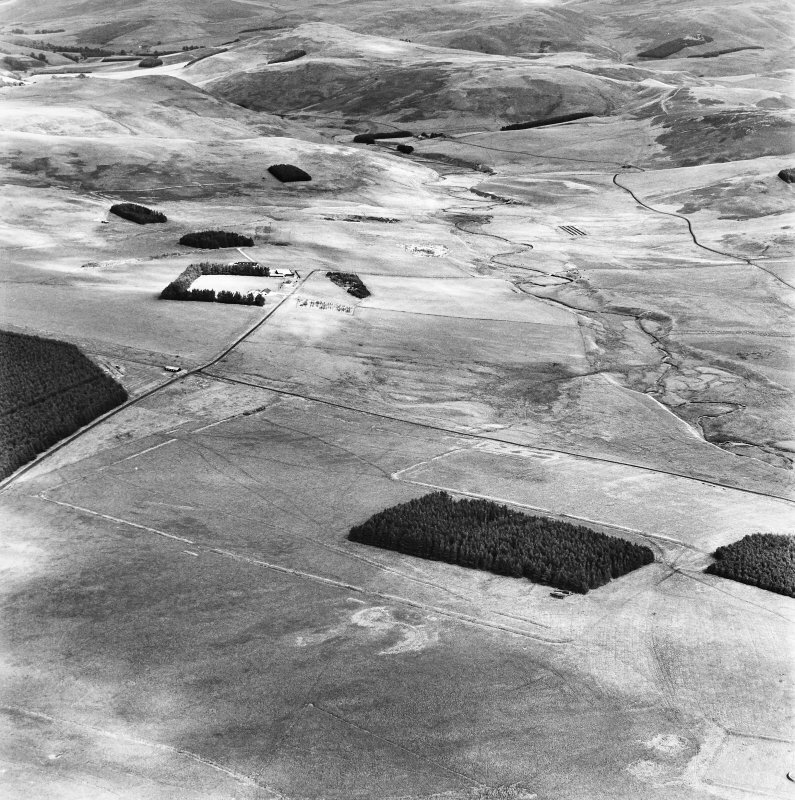 The course of 'Dere Street' is visible in the top left-hand corner of the photograph. 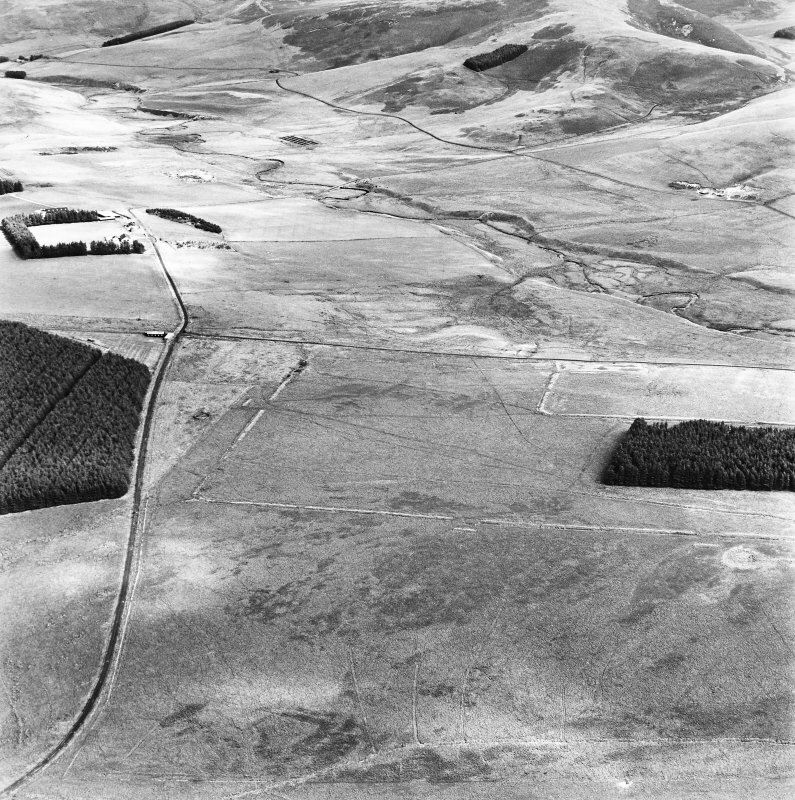 General oblique aerial view centred on the remains of the Roman Temporary Camps and the linear earthwork at Pennymuir with the Kale Water, Hangingshaw Hill and Humblemoor Hill beyond, looking E.
Oblique aerial view centred on the remains of the Roman Temporary Camps and the linear earthwork at Pennymuir, looking SW.
Oblique aerial view centred on the remains of the Roman Temporary Camps and the linear earthwork at Pennymuir, looking NW. 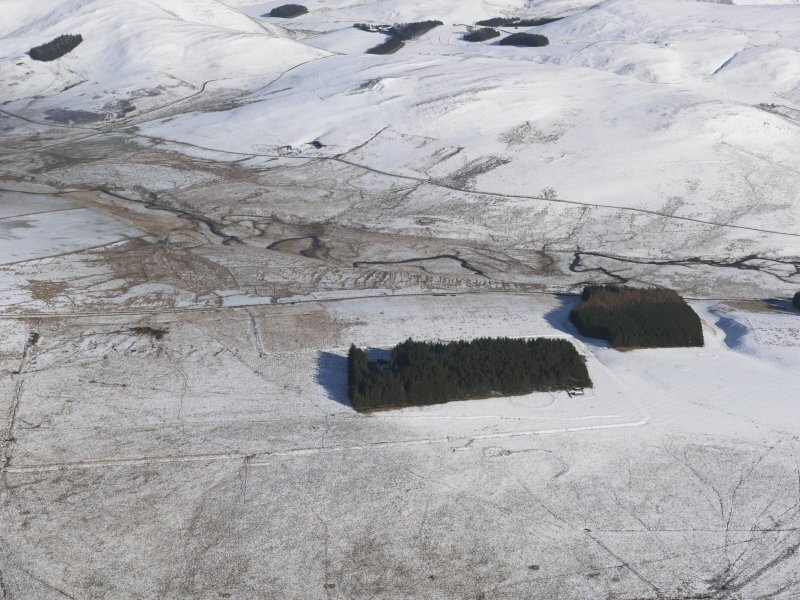 Pennymuir, oblique aerial view, taken from the SSE, centred on two Roman Temporary Camps and a linear earthwork. 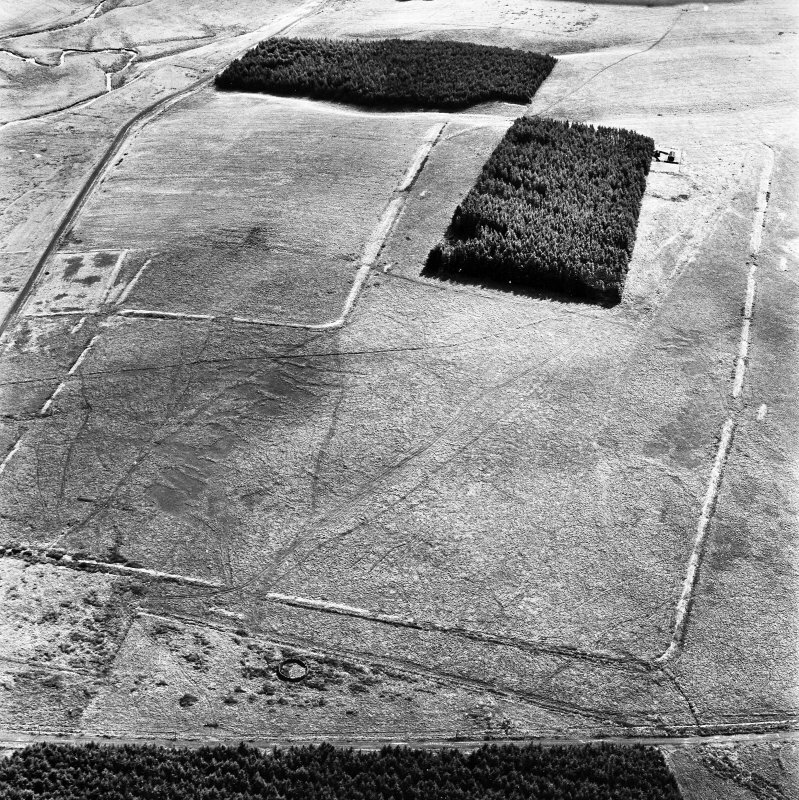 Oblique aerial view centred on the remains of the Roman Temporary Camps and the linear earthwork at Pennymuir, looking E.
Pennymuir, oblique aerial view, taken from the WSW, centred on three Roman Temporary Camps, a linear earthwork and an area of rig. 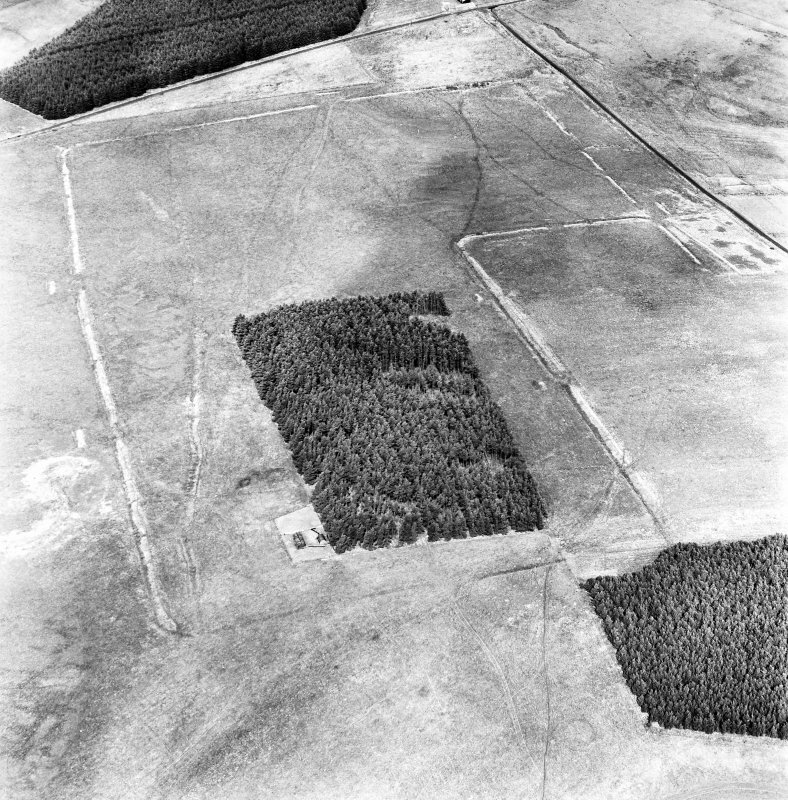 The course of 'Dere Street' is shown in the centre of the photograph. Oblique aerial view centred on the remains of the Roman Temporary Camps and the linear earthwork at Pennymuir, looking SE. 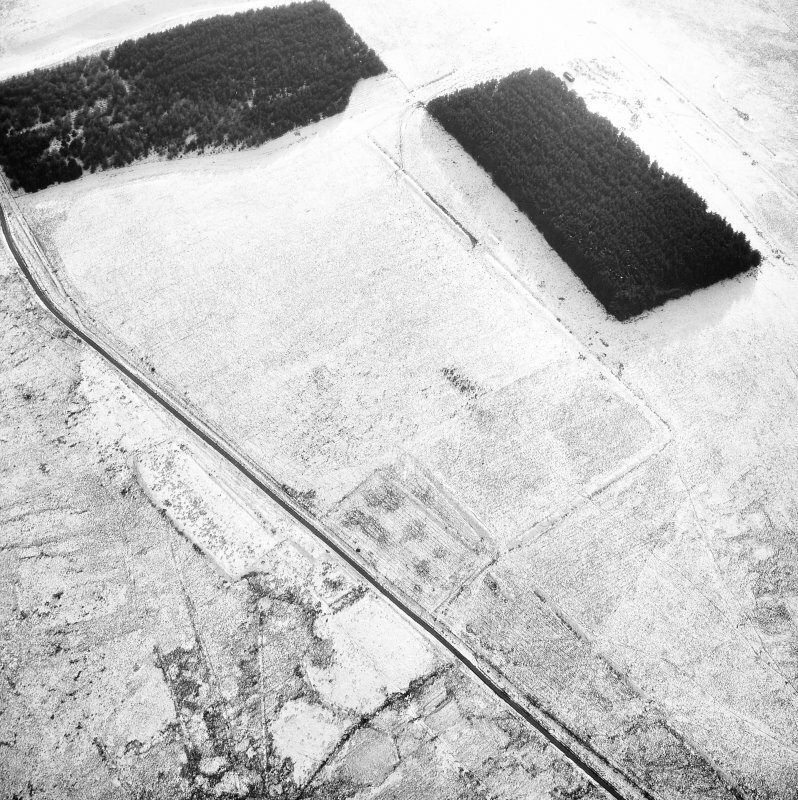 Oblique aerial view centred on the remains of the Roman Temporary Camps and the linear earthwork at Pennymuir, looking WSW. 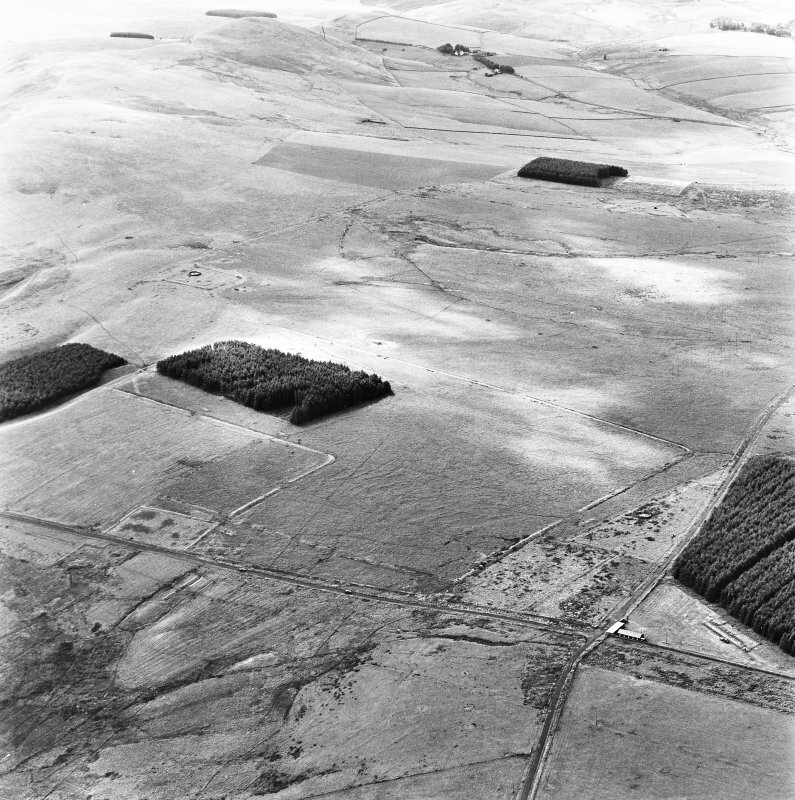 Camp A: (RCAHMS 1956, plans, figs), the largest of the group, lies close to the W side of Dere Street on a platform of moderately even ground which slopes gently to N and E. Its S end lies on the edge of a small, dry gully. 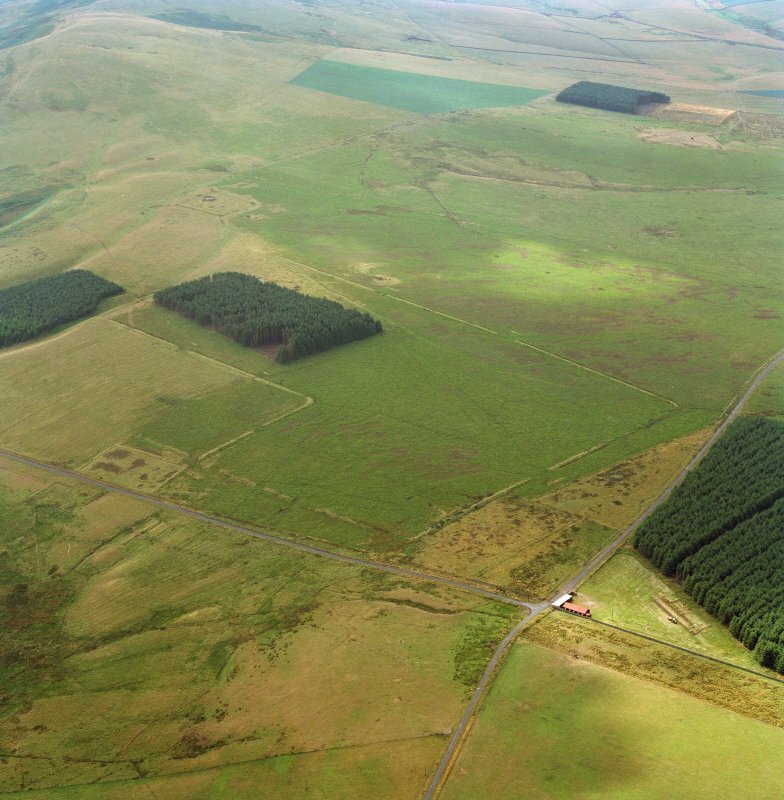 Approximately rectangular in shape, it encloses 42 acres, an area sufficient for the accommodation of two legions. 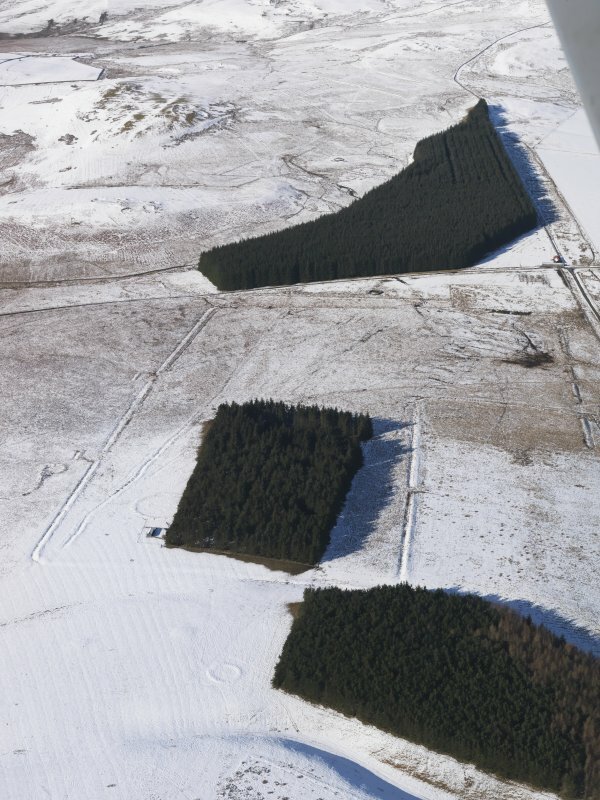 The E and W sides are each 1705' long, the N side 1080' and the S side 1155'. 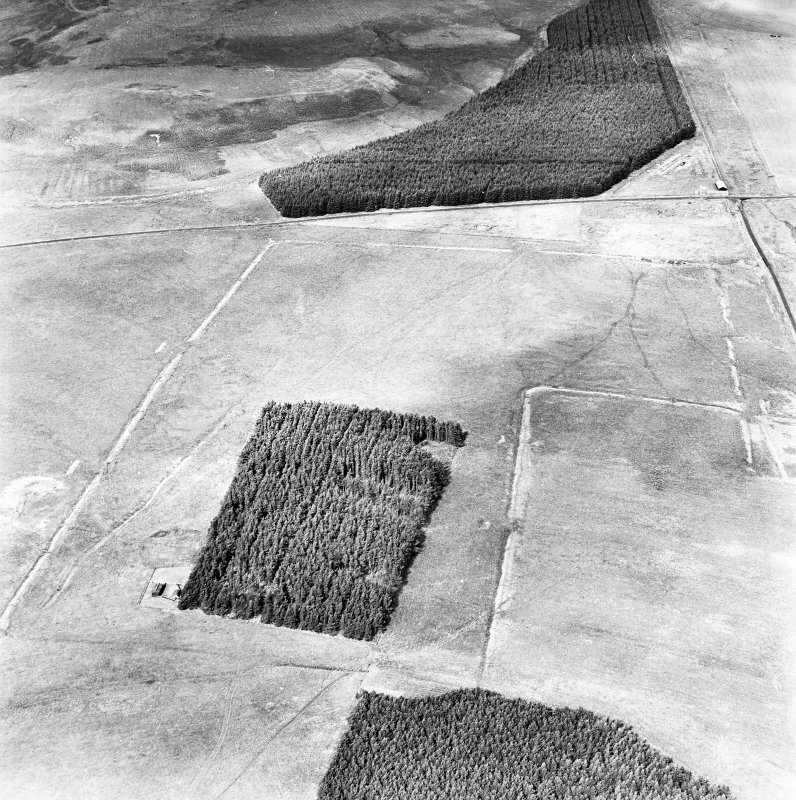 The southern half of the E side, and practically the whole of the S side, have been obliterated by rig-cultivation, but the missing sections are, for the most part, revealed by vegetation marks on air photographs. 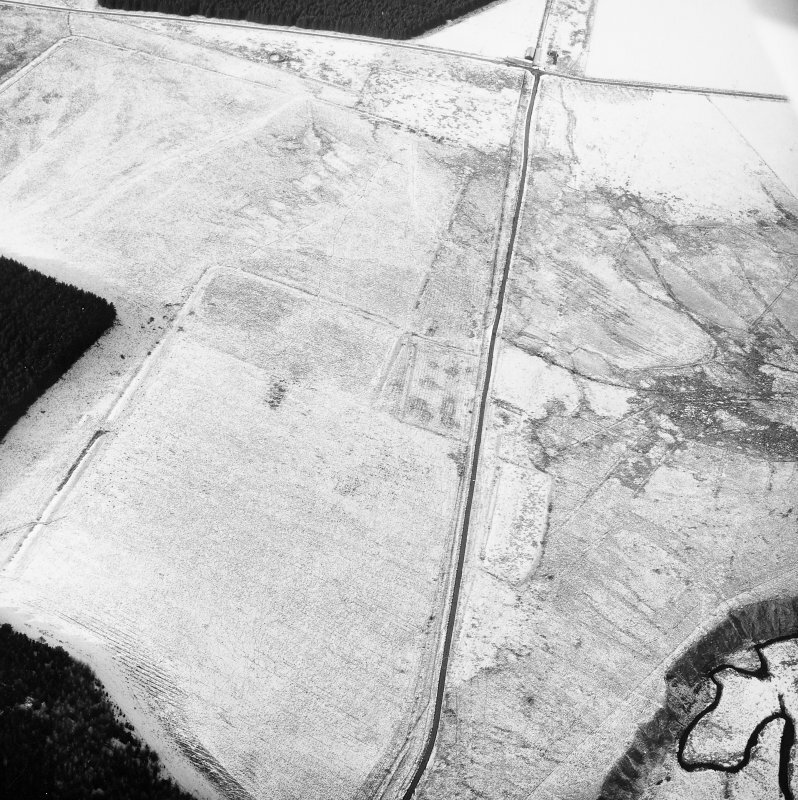 Elsewhere the defences have not been ploughed and are in a fine state of preservation. 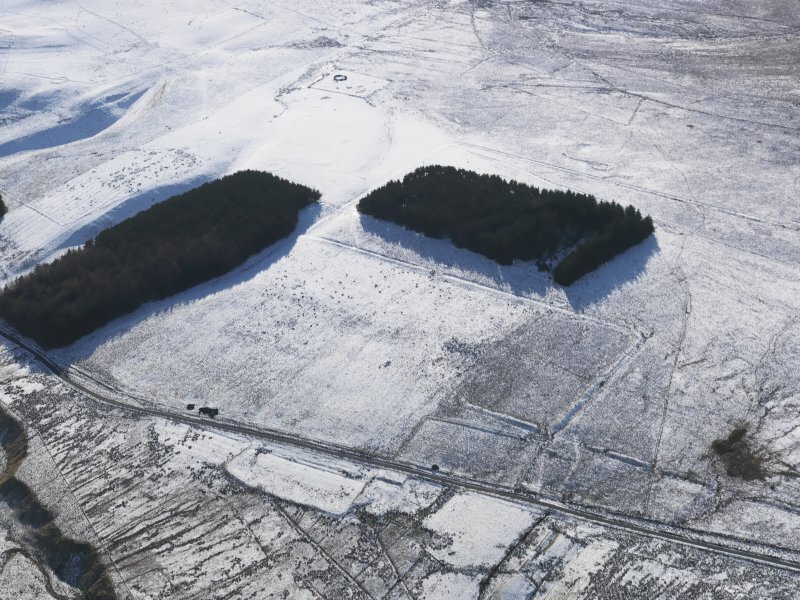 The rampart, which is formed of upcast material from the ditch, measures some 15' in thickness at the base and up to 4' high, while the ditch is 15' wide and occasionally attains a depth of 4'. 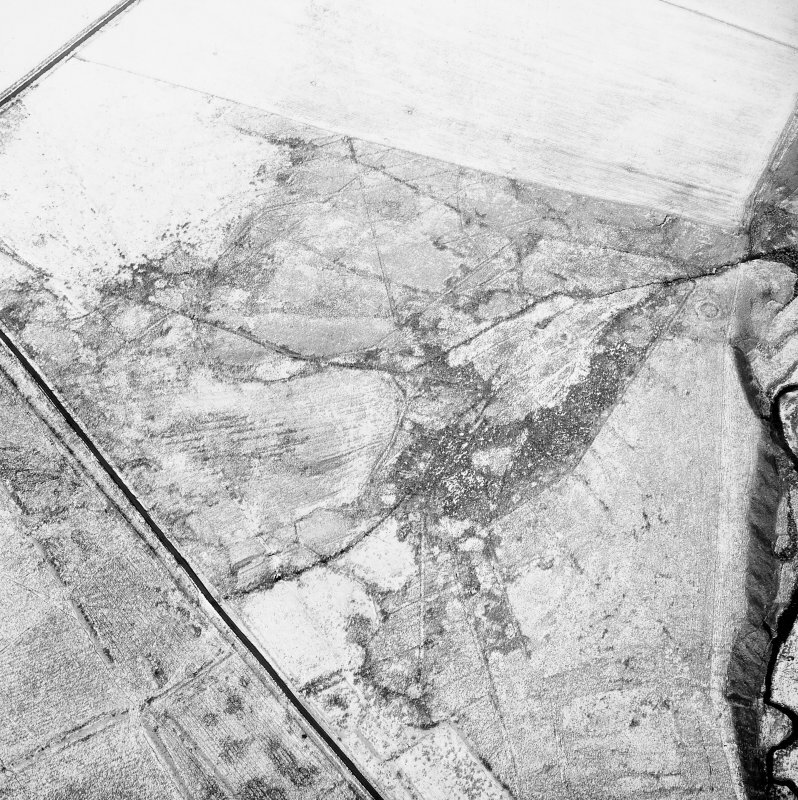 There is little or no berm. 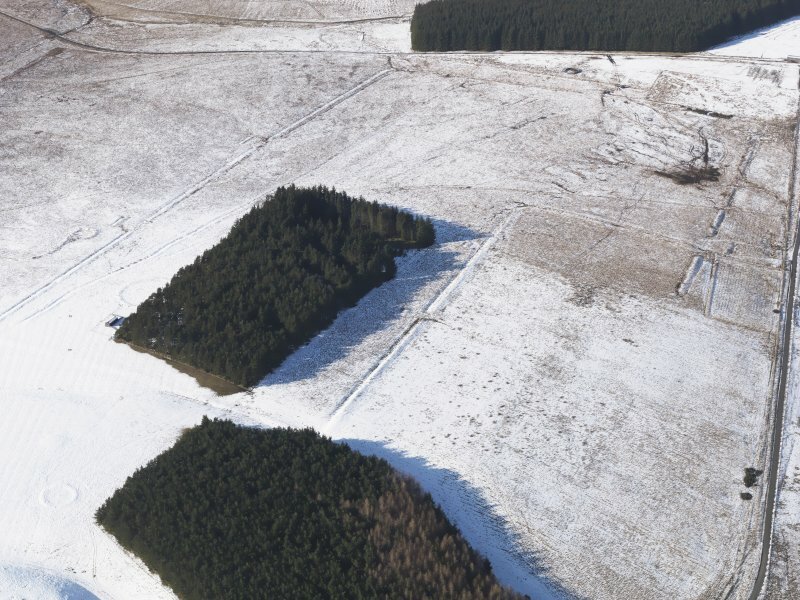 Five gates are now visible and a sixth may be assumed to have existed in the E side, matching the southernmost of the two W gates. 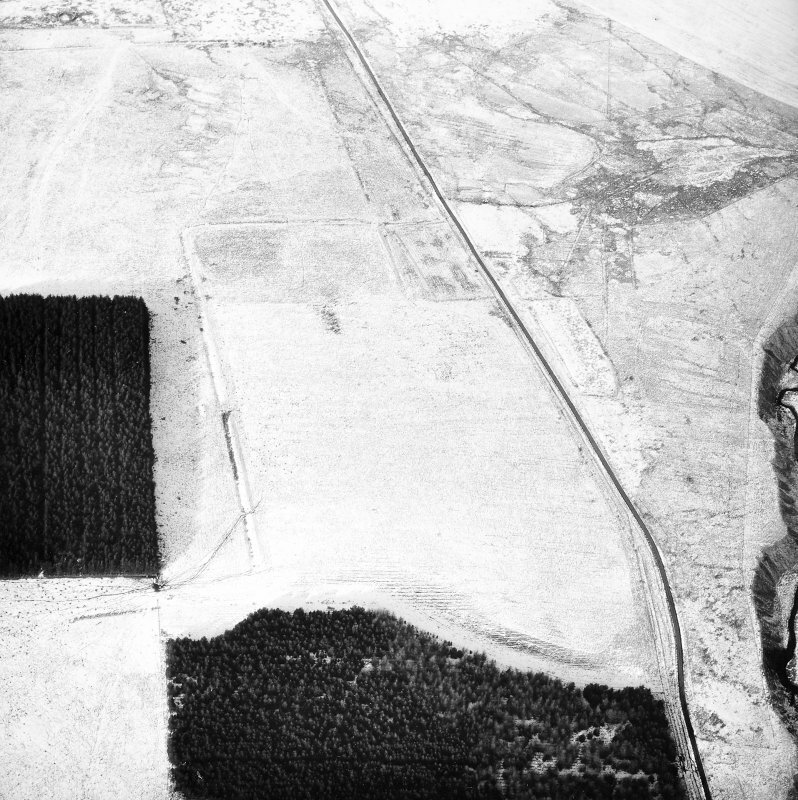 The gates vary from 57' to 68' in width and are all protected by traverses: their relationship suggests that the camp faced northwards. 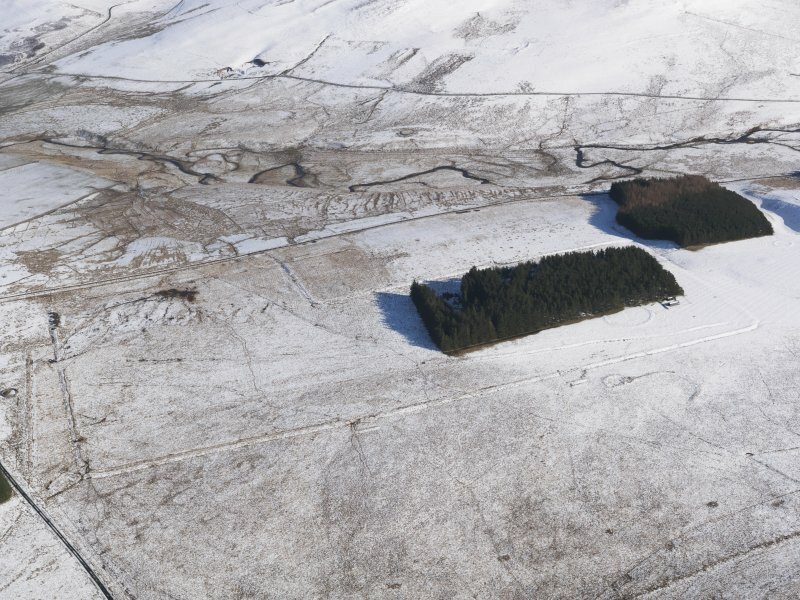 The earthworks shown on the OS map both inside and outside the SW corner of the camp are not of Roman date: two of them are sheep-folds while the third is a land boundary. Centred NT 755 139. 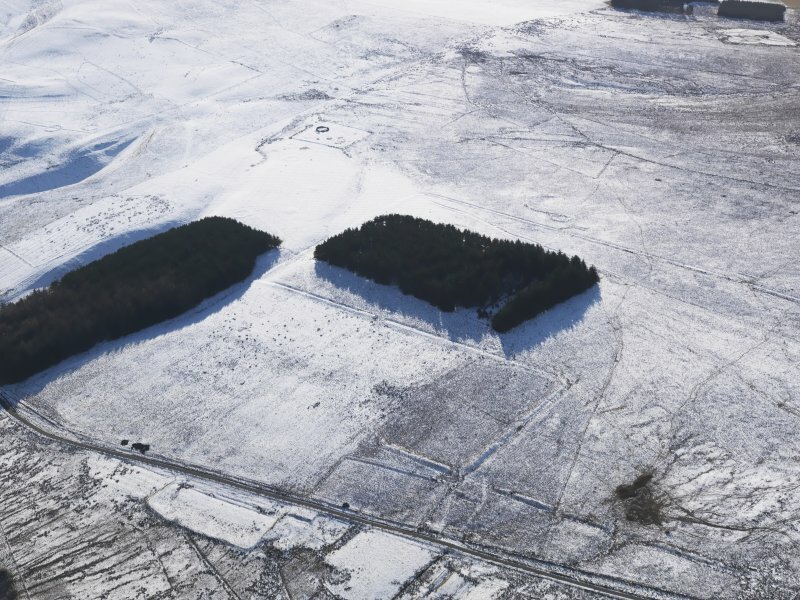 The remains of Camps 'A' and 'B' have been fully described above. 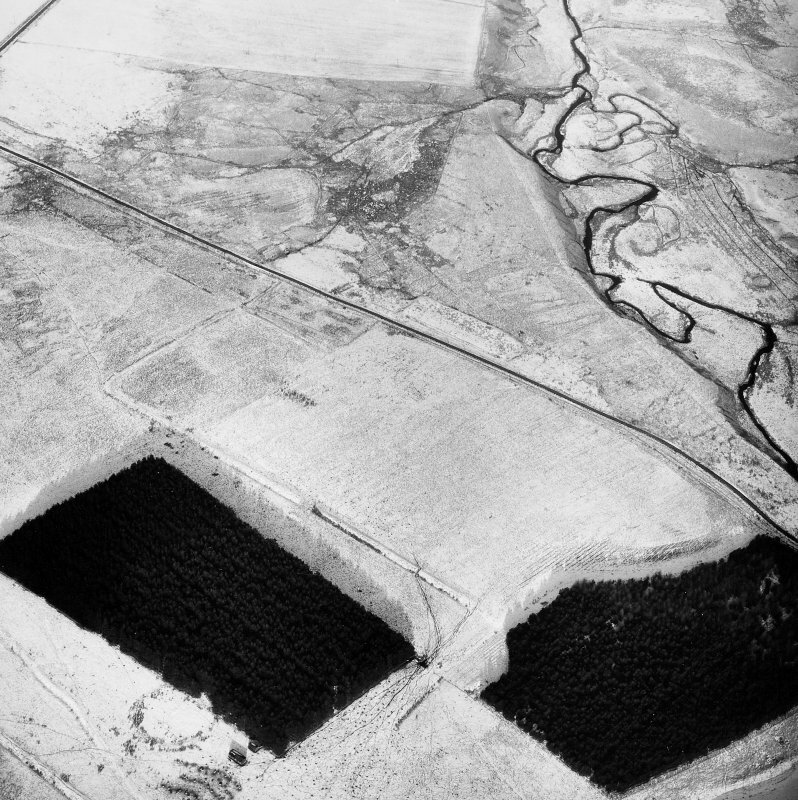 As stated, the earthworks within and without the SW angle are later works: two sheepfolds and an old turf (? field) bank. 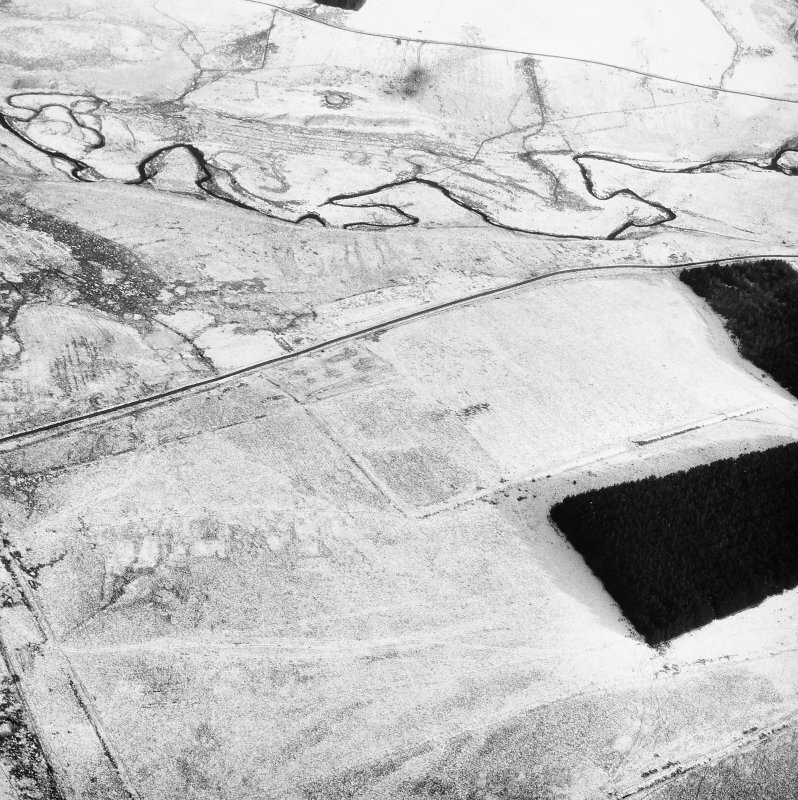 walk); thence to Shotheids, Rennieston and the now vanished fort at Cappuck. 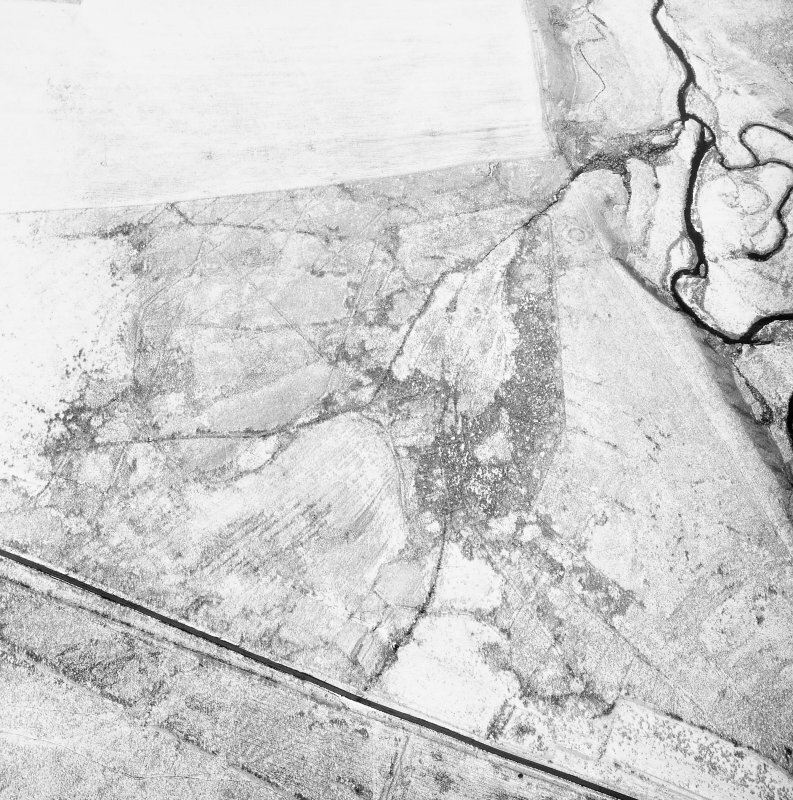 It crosses the Teviot, in the vicinity ofMonteviot House, and thus to Newstead, Lauderdale, Soutra and the Forth. 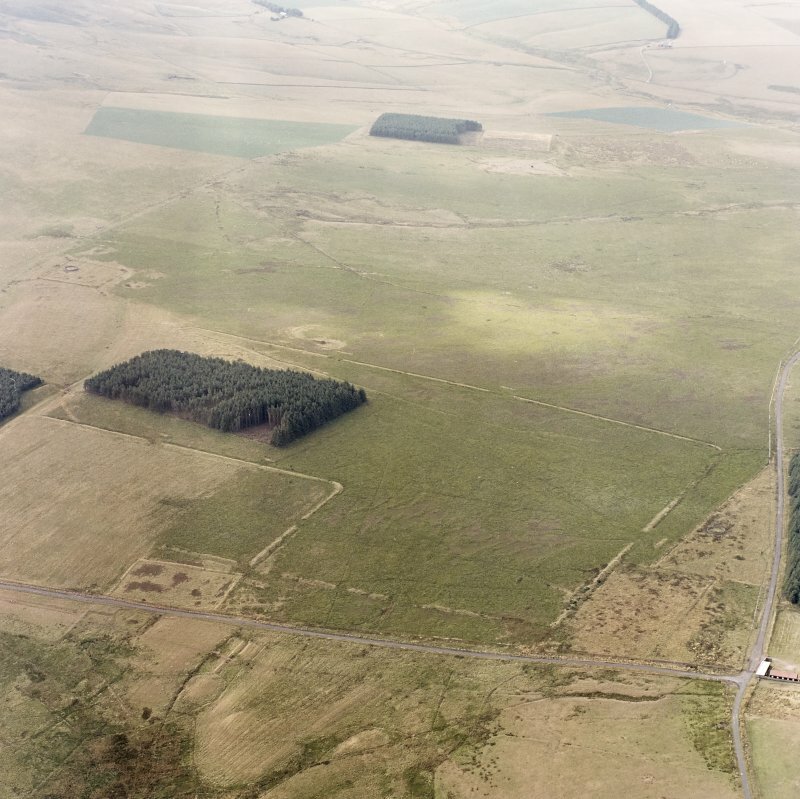 There are four camps bleakly situated at Pennymuir. 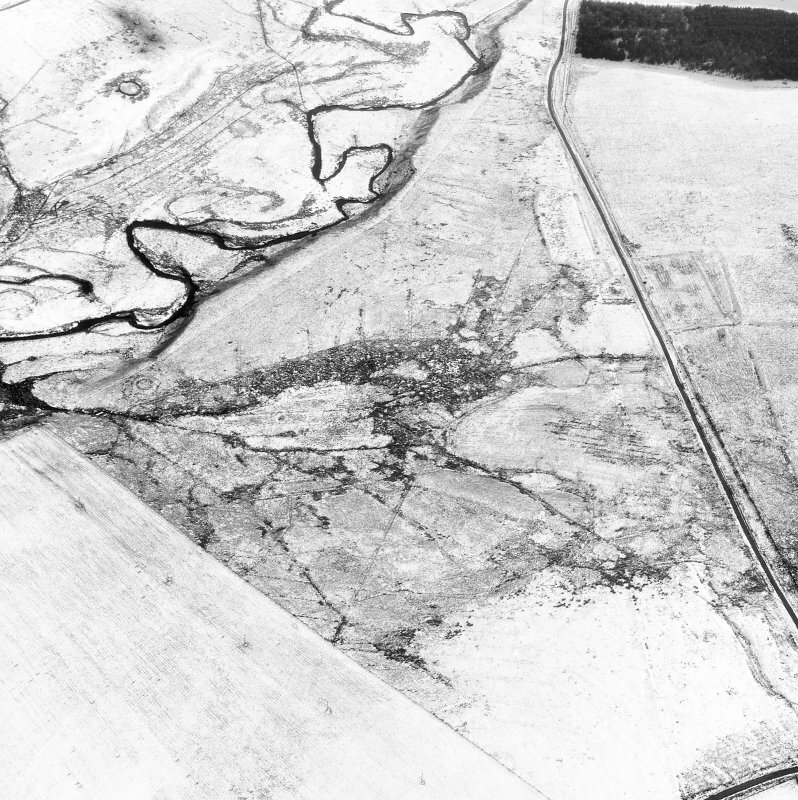 One right down by the Kale Water (NT 757138) is badly eroded by both the river and by subsequent cultivation. 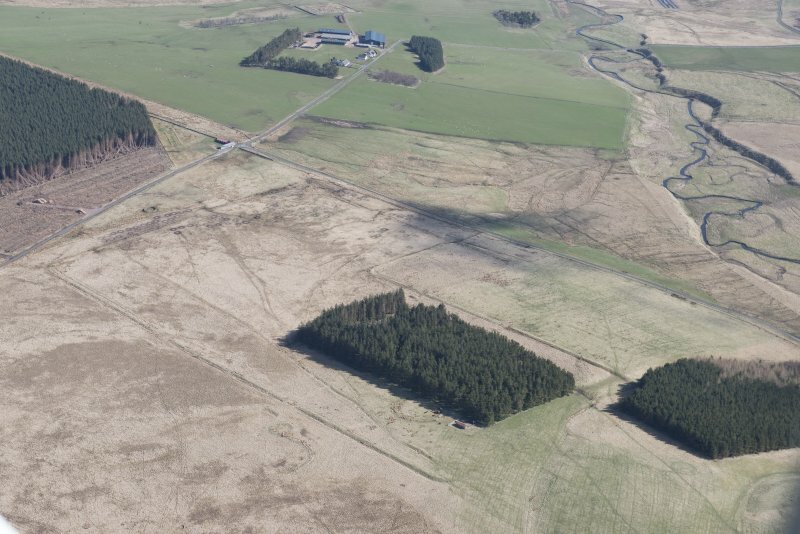 A second camp (NT 756144) is bisected by the Pennymuir-Hownam road-though the western third survives sufficiently to show a trapezoidal rather than rectangular plan. 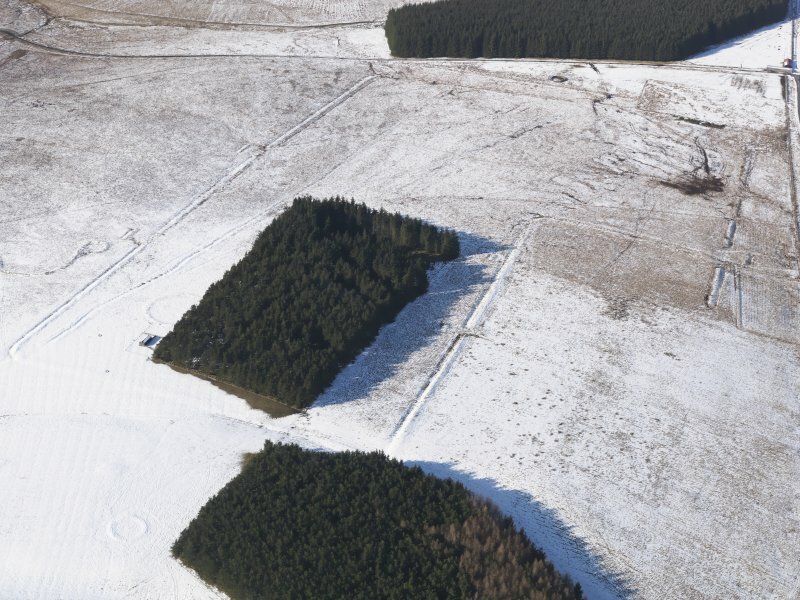 The lie of the ground would not have required this; rather may it have been due to a misuse of sighting lines or to the availability of only short measuring rods! 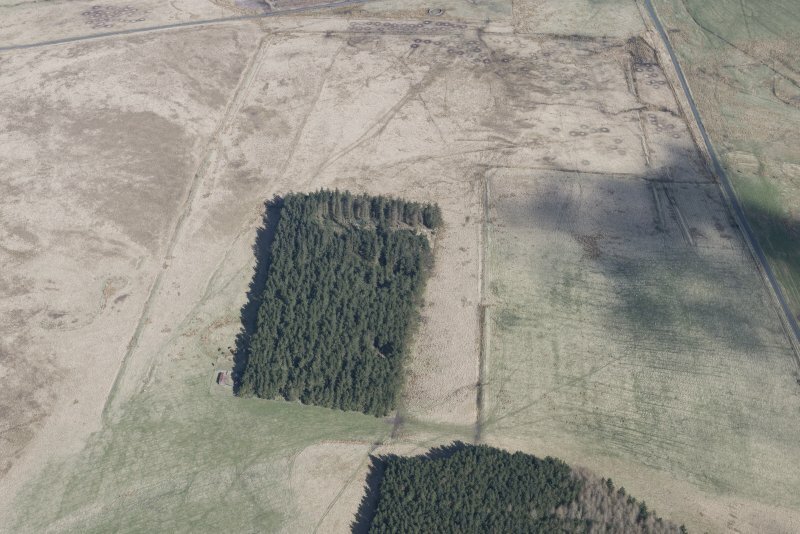 The most visible camp, and the largest, lies to the west of the Roman road (NT 754138)-here the line of the little road from Pennyrnuir to Tow Ford. 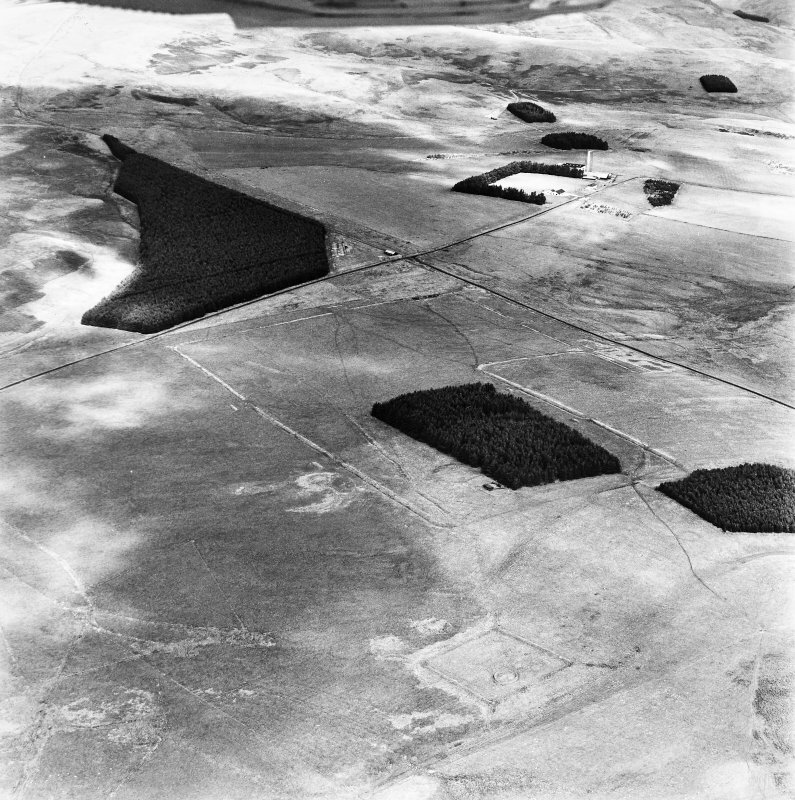 Most of the south side and the south part of the east side have been obliterated by rig-cultivation, but sufficient remains to show that this corner of the camp contained a separate smaller camp. 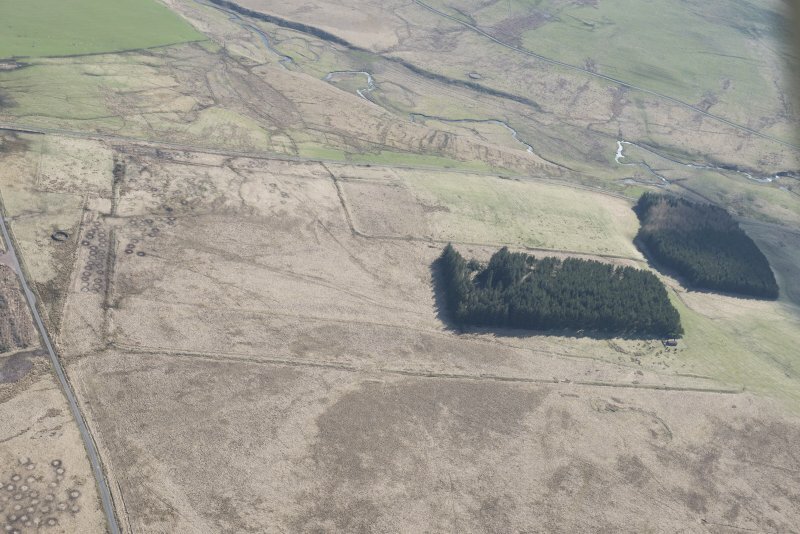 Since the ditch of the latter cuts across the rampart of the larger camp it must be secondary, but like the larger version it seems to have had six gates, each of them protected by a 'traverse'-a blocking banier set outside the entrance, allowing access only round its ends. 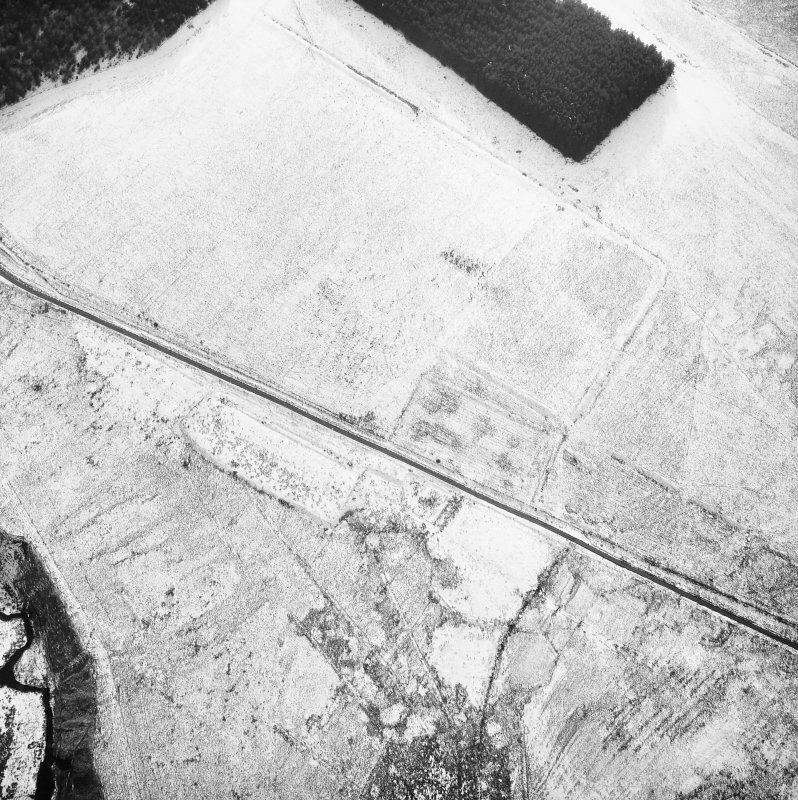 Both camps were enclosed by a rampart formed from the upcast from a single, outer ditch. 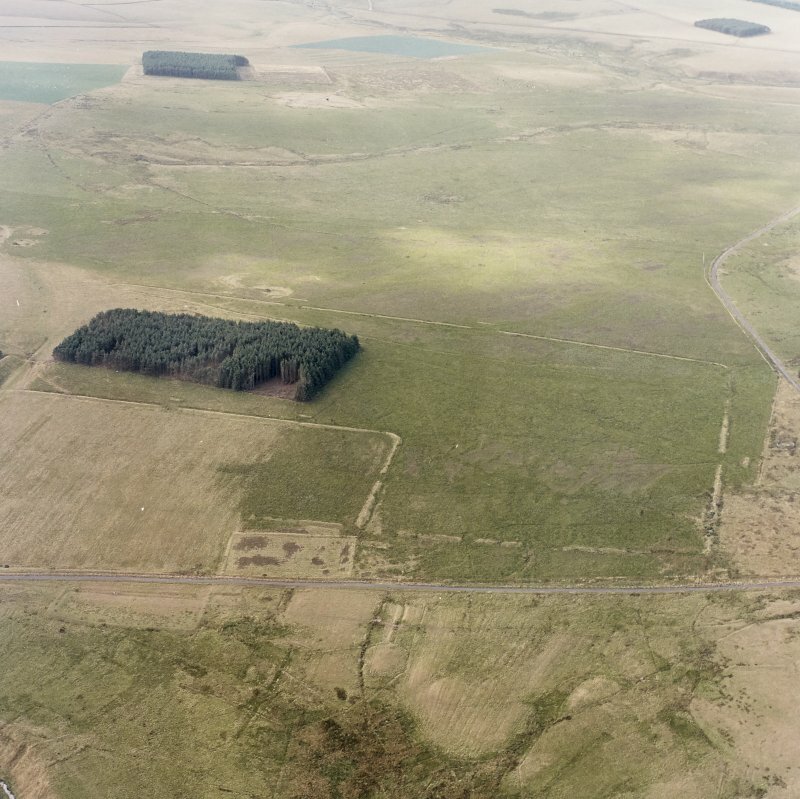 It may be assumed that these temporary camps were training bases, providing tented accommodation for troops on exercise, most commonly perhaps on Wo den Law (no. 83). 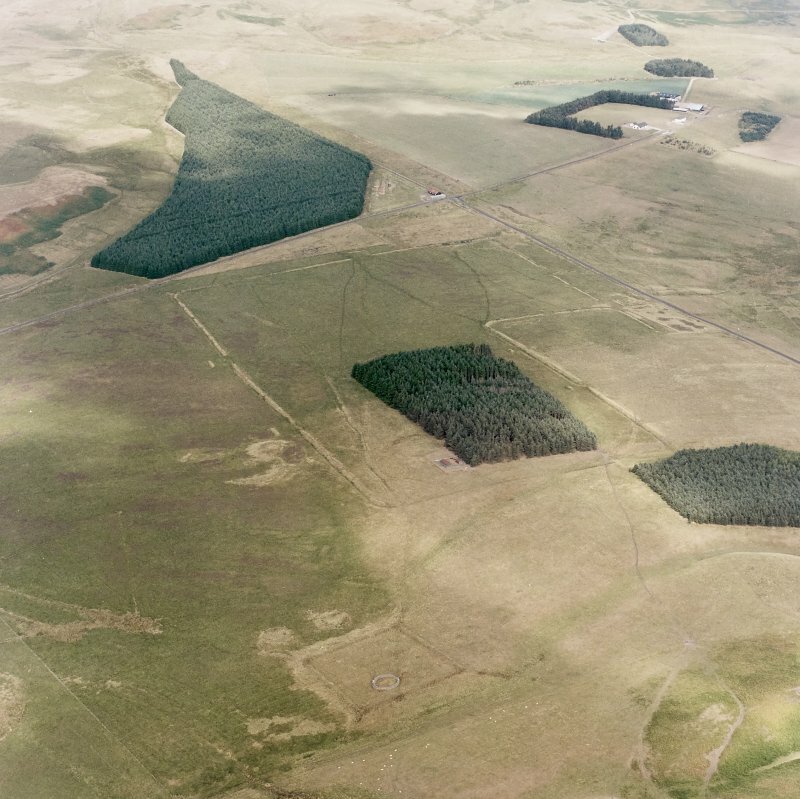 The largest camp spreads over some 17 ha and could certainly have accommodated two legions-GOOD men or more. It may, however, simply have been a temporary marching camp.